Metro Bike Share expands to Central L.A.
New Metro Bike Share station at 7th and Berendo in Central L.A.
Metro, in partnership with the Los Angeles Department of Transportation (LADOT), has begun expansion of its Metro Bike Share network into Central Los Angeles, with more than 40 new stations in MacArthur Park, Rampart Village, Koreatown, Echo Park, Silver Lake and surrounding communities. 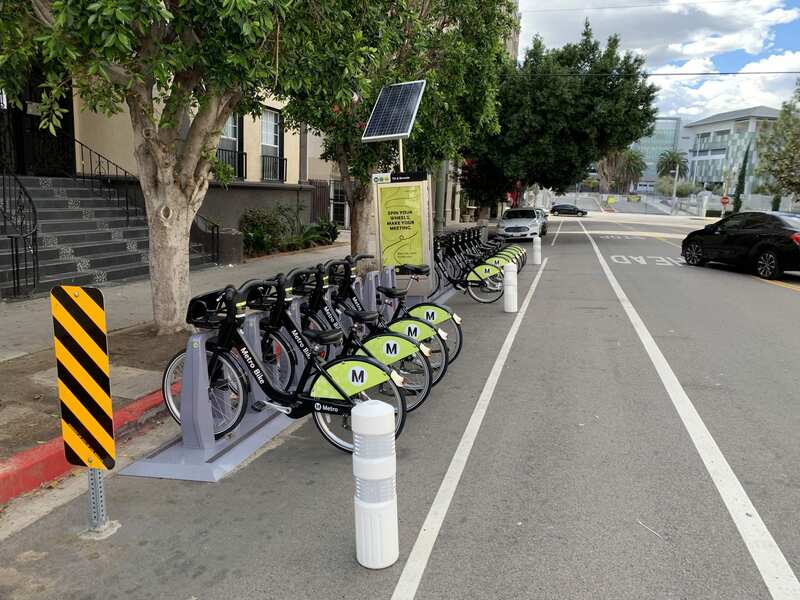 The expansion will augment the existing downtown L.A. area bike share stations, creating a more comprehensive and robust network for Angelenos seeking to complete their first and last mile journeys on two wheels. 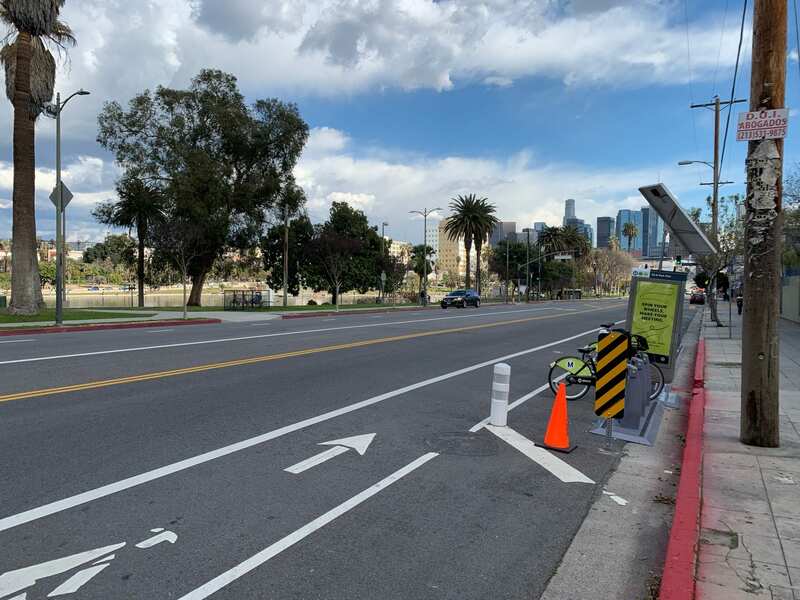 A new station adjacent to MacArthur Park in L.A.
New bike share stations are now available at Union Avenue and Olympic Boulevard, Westlake Avenue and 3rd Street, 8th Street and Vermont Avenue and Shatto Place and Wilshire Boulevard. Stations have also been added at the Westlake/MacArthur Park Red/Purple Line Station, 7th Street and Park View Street, 4th Street and Vermont Avenue, 7th Street and Berendo Street and Union Avenue and 7th Street. Additional stations will be installed in Koreatown, Echo Park and Silver Lake over the next few months. All new stations will have the classic Metro Bikes that are docked to stations. The selection of station locations was based on extensive community feedback. Metro and LADOT worked with various neighborhood organizations and used crowdsourcing to identify where community members would most like bike share stations located. Flyers were posted at each potential station location to encourage comments from local community members. The Metro Bike program is administered by Metro in partnership with local agencies, including LADOT and the Port of Los Angeles. It is operated by Bicycle Transit Systems, Inc.
For regular updates on new station installations, follow @bikemetro on Twitter, Instagram and Facebook. For additional information on new services, options and incentives, visit Metro Bike share website at www.metro.net/bikeshare.